How long has it been since you’ve taken a real good look at your roof? If you’re reading this article then we bet it was quite recently. Most roofs last between 20 and 25 years. You are going to want to find out whether the old roof was fully removed and you only have one layer of shingles. In this case, you don’t have to go for a full new roof. However, if the roof was installed over another layer or multiple layers, and it is older than 20 years, chances are you need a new roof. With age, shingles will curl or buckle. You will notice this especially on the slopes of your home that get direct sunlight. This means that your roof is now defective. 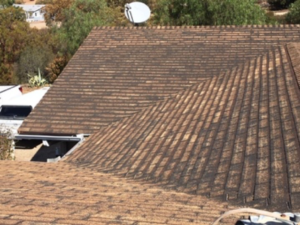 Curling or clawing shingles are a sign that your roof has been through excessive heat. Since they have corners that are lifted, they are more susceptible to wind uplift and ice damage. Shingles will become rigid and can break easily and lose tab edges. Shingles that are buckled have a visible wave distortion, that usually runs vertically up a roof slope. These are also highly susceptible to wind and ice damage just as the curled shingles. Keep in mind that both roof age and wet or poorly installed underlayment can be the common causes of buckling/curling shingles. The valleys are the most important areas of a roof since these are most impacted by the weather. Since snow and rain flow through valleys and into gutters, you want to ensure that the valley is not compromised. This will protect you from leaks in your roof. Missing shingles can occur due to age or during a storm. If you notice missing shingles do not wait too long to replace them or your roof. During this time the integrity of your roof is compromised and can result in leaks and more wear and tear. Sometimes the shingles are just broken rather than completely pulled off, however, this does not give you much extra protection. When you are cleaning your gutters, make sure to take a look into them to see whether they are loaded up with shingle granules. It is quite common for foods tend to lose more granules toward the end of their life cycle. 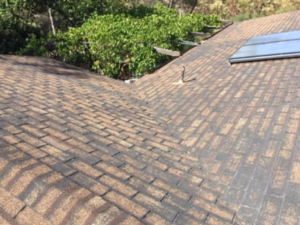 If you notice that your roof has some darker or lighters shingles it means that you are experiencing wear in different areas. A quick check you can do without going on your roof is to check your attic to see if there is any daylight coming through the roof boards, this will allow you to find the shingles in need of repair quicker. The aging of your roof or physical damage can also cause bare spots and a loss of granules. The worst part is that when the protective granules are lost the shingle begins to harden from heat and sun exposure. This will accelerate aging and shingle decay and can become an entry point for water. As well, you may notice a spongy feel when walking on the roof, which means the underlying decking is weakened from moisture, which is coming through the thinner shingles. 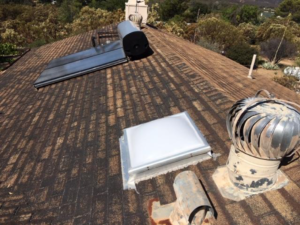 Te flashing which is located around skylights, valleys, eaves, stacks, and chimneys are all subject to separation, lifting, and dried out caulking. If you notice any of the signs noted above you may need to have your roof repaired or replaced by a certified roofing contractor. Since roof leak is not always apparent immediately on the inside of your home, you should not hesitate. Water can lead to the damaging of insulation and deck sheathing causing replacement costs to grow. Call a professional roofing contractor before your problems grow. Let us here at Millenium Roofing give you peace of mind.